Obsessed with this salad!!! The end. Just kidding. Not about being obsessed with the salad, just about leaving you hanging. I taught this last year in my Thanksgiving classes and I couldn’t wait for class to be over so I could eat this which I did for three weeks straight. 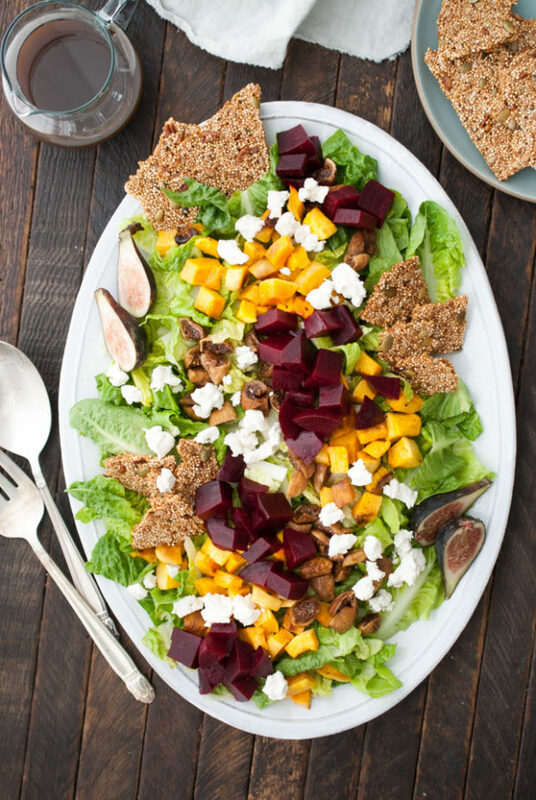 The combo of the sweet beets and squash and the creamy goat cheese (sub avocado if you don’t do cheese) and the crunchy QUINOA BRITTLE. Oh my stars, the quinoa brittle is everything. I actually made it for many a cheeseboard after I taught this recipe. 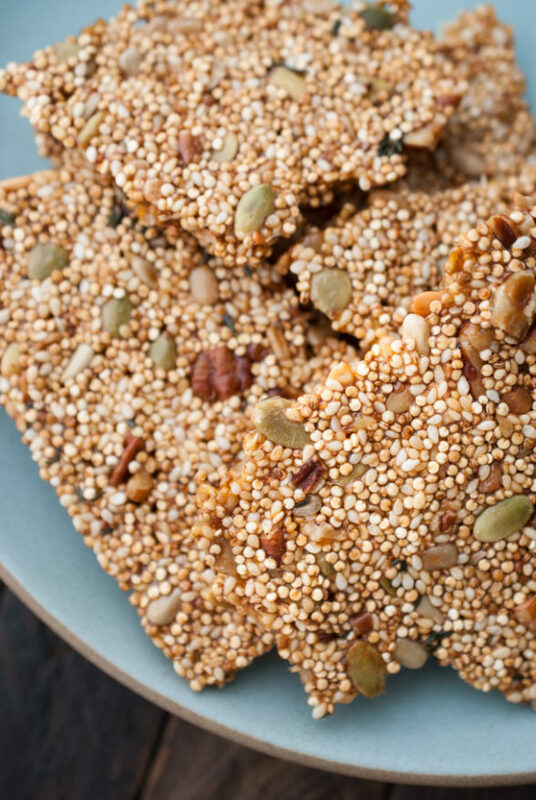 Picture a crunchy, nubby, salty-sweet cracker and that’s what this quinoa brittle is. And it’s packed with protein. Spread a little goat cheese on a piece and you have the perfect snack. Sorry, I think that is so boring. Salads save the day! They don’t rely on your hard-working oven. Salads are colorful. They are light and fresh. And they provide acidity to balance the richness. Most of the time, salad components can be prepped in advance. Plus, they are flexible. Don’t like butternut squash? Sub roasted carrots. Dairy-free? Swap the cheese for avocado. Thanksgiving is less than 3 weeks away, so it’s time to get that menu tightened up! Question — do you make non-starchy vegetables and/or salad on Thanksgiving? To make the dressing, place all dressing ingredients in a screw-top jar and shake until combined. Set aside. Heat oven to 400 degrees and arrange the squash on a rimmed baking sheet lined with parchment paper. Toss to coat with oil and sprinkle with salt and pepper. Roast until tender and caramelized, about 20-30 minutes. Arrange the romaine on a large platter or bowl and toss with enough dressing to lightly coat. 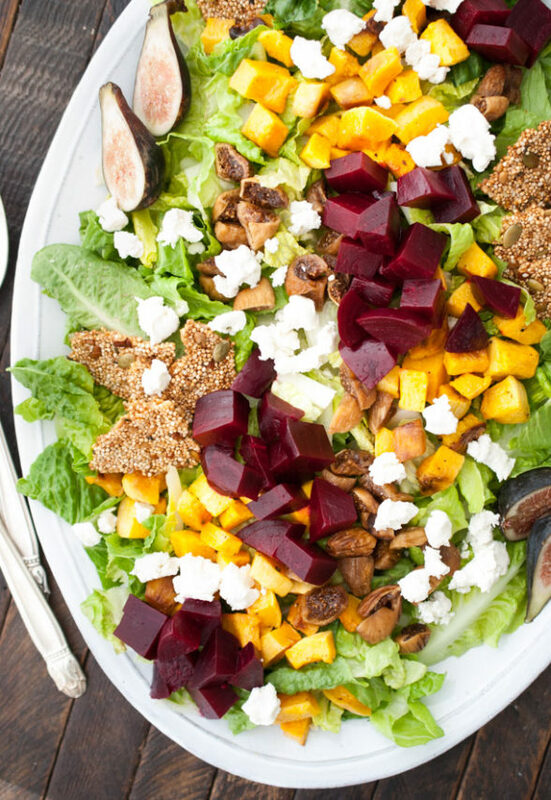 Arrange the beets, figs, cheese or avocado on top of the greens and drizzle with more dressing. Top with quinoa brittle or serve on the side. For the Quinoa brittle: Preheat the oven to 325 degrees. Line a small baking sheet with unbleached parchment paper. In a medium bowl, combine all ingredients except syrup and oil. In a small mixing bowl, whisk together the brown rice syrup and coconut oil until well combined. Pour over the quinoa mixture and stir to combine. Pour mixture onto baking sheet and spread into one even ¼-inch layer using a dampened spatula if necessary. Bake for 20 minutes or until golden. Allow to cool, break into pieces. 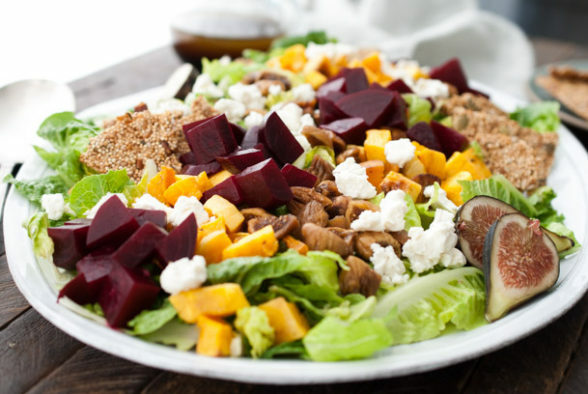 You can prep all the components of this salad a day in advance and refrigerate them separately. Bring them to room temp the next day and assemble before serving. The quinoa brittle can be made 5 days in advance and stored in an airtight container at room temp. « Planning a Happy Thanksgiving 2017– 3 Weeks and Counting! Do you soak the uncooked quinoa before making the brittle? What is a sub for brown rice syrup? I don’t think they have it at vons and want to make this tonight!! I know corn syrup will work, but it’s not super healthy. I have no idea if you can make this with maple syrup. It might not be sticky enough. You could try. I would use maple syrup first. I ended up making the brittle twice. Ones with molasses and the second time with barley malt syrup (all 5 stores I visited were out of rice syrup and I won’t use corn syrup). Both times it came out great! Personally, I prefer barley malt syrup, however, the bake time was around 10-15 min before it starts burning. Thank you for a fantastic salad. Thank you so much for replying with your feedback. Since Lundberg took their brown rice syrup off the market, we’ve all been scrambling to find good substitutes. Much appreciated for the tips! Amazing salad idea! I have a quinoa allergy, though; any substitution recommendations? Delicious! Filled with so many good ingredients. I’m wondering what you think about substituting maple syrup for brown rice syrup? Love the idea of your quinoa brittle but I would not use the coconut oil. Can you recommend a substitute?